How to AirPlay iPhone 7 to Mac in 3 Steps? Apple's AirPlay technology enables you to AirPlay iPhone 7 to Mac or Windows 10 with a free & 3rd-party AirPlay sender. This guide details on a how to use iPhone AirPlay to PC/Mac. Now that you have the latest iPhone 7 hand, learn the easiest way to enable iPhone 7 AirPlay to facilitate wireless video and music streaming? Let's get a closer pictures of the new iPhone 7 model and learn to use iPhone 7 AirPlay here and now! iPhone 7 AirPlay doesn't natively recognize Mac or PC as targets. However, with a freeware installed on computer, you can enable AirPlay on iPhone 7 iOS 10 to AirPlay MP4 MKV AVI. Install and launch 5KPlayer on Mac/Windows, and your iPhone 7	/7 Plus can detect it as the destination to send videos and music, saving you the trouble of USB syncing! Part 2: AirPlay iPhone 7 to Mac and Recorded iPhone Screen: Videos, Games, etc. Part 3: Why Do We Choose 5KPlayer as iPhone 7 AirPlay Server? Part 4: How to Enable iPhone (7/7 Plus) AirPlay without Homescreen button? With the long-expected iPhone 7 (Plus) finally greeting audience with its TSMC aided to develop Hexa-core A10, this move really makes multi-task processing on iPhone 7 easier than ever. That being said, you can count on a much-improved iPhone 7/7 Plus Airplay stability. Compared with the 1.8GHz dual-core A9 processor in iPhone SE/6s/6s Plus, which features a 70% faster processing speed than the iPhone 6 with A8. The AirPlay quality you can get from this brand-new model embraces almost no AirPlay lags and image stutters from iPhone 7/7 Plus. The native AirPlay from iPhone to Apple TV (Mac) only may not appeal to most Windows user as you have to rely on QuickTime Player, which you don't often use at all as a media player. That being said, a free video player 5KPlayer overhauls to enable you AirPlay from iPhone 7 to Mac: With H.265 streaming technology, you can expect this non-faulty AirPlay sender to easiliy take iPhone 7 video AirPlay to the next stage, when the rest of out-dated AirPlay servers still trapped by AirPlay not working with iOS 9, 5KPlayer proves its iOS 10 compatibility right after the September 13th release. If you've got plans on iPhone 7/7 Plus, or you already have one, but the old AirPlay receiver is already suffering AirPlay not working with iOS 10 problems, then try 5KPlayer. Apart from it excellents AirPlay iOS 10 performance, 5KPlayer can easily work as a screen recorder iOS 10 so that it can record what happens on your iPhone screen, and save the record into mp4 videos. Now that we have confirmed Apple chose not to switch its iPhone 7 screen from LCD to OLED, iPhone 7/7 Plus sticks to the 4.7-inch, 5.5-inch screen respectively, then sharing video without iPhone 7 AirPlay would ask you to huddle; Furthermore it's perhaps too early to expect for OLED from iPhone 7/7 Plus. Apple's screen manufacturer - JDI just announced their plan to put OLED screens into vast production in 2019. Then perhaps it's not iPhone 7 but 8 to be wraparound with OLED. In this case, the easiest way to blow up your video is to AirPlay iPhone 7/7 Plus to Mac/Windows. Turn this computer you are using right now into an AirPlay receiver by installing 5KPlayer on Mac, so that you can enable AirPlay on iPhone 7. Once you connect iPhone 7/7 Plus and the computer to the same Wi-Fi, the built-in Bonjour protocol enables iPhone 7/7 Plus AirPlay (iPhone SE/6/6 Plus) and channels any videos, music to the computer, just like the process of AirPlay iPhone 6 to Mac with 5KPlayer. Why Do We Choose 5KPlayer as iPhone 7 AirPlay Server? You'll need to install an AirPlay receiver for Mac/PC in order to AirPlay iPhone 7/7 Plus iOS 10 videos to Mac/PC. The free 5KPlayer - AirPlay receiver and sender 2-in-1 is a pretty reliable piece of tool to rely on: It can stream MP4, MOV, M4V videos and wireless stream music from iPhone 7 by way of AirPlay iPhone 7/7 Plus iOS 10 to Windows 10 or Mac. Launch 5KPlayer after you connect iPhone and computer to the same Wi-Fi, then you can enable AirPlay on iPhone. If you have doubts on which AirPlayer to choose, take a look at this review of 5KPlayer/X-Mirage/Airserver, it's not hard to find the free 5KPlayer equating paid alternates in terms of video AirPlay, music AirPlay and screen mirroring. 5KPlayer can not only team up with iPhone 7 AirPlay: You computer with it can also work as an AirPlay sender to TV, which means when you connect the laptop to TV wirelessly, 5KPlayer can reflect the video it is playing instantly to the Apple TV screen. How to Enable iPhone 7 AirPlay without Homescreen button? Step 2: Directly swipe up from the button of iPhone 7's screen can call out the Control Center for you, where you may set to iPhone 7 AirPlay to Mac. Tips: When watching videos on iPhone 7 iOS 10, users can directly AirPlay YouTube videos with the iOS YouTube APP, or AirPlay YouTube Music APP by pressing on iPhone screen > AirPlay > Computer (choose your computer name). Download to your PC or Mac this AirPlay receiver for iPhone 7/7 Plus, which helps install the Bonjour protocol to your computer so that it recognizes the streaming signals your iPhone sends to AirPlay iPhone 7 (Plus). When the installation is successful, double click the icon to launch it. Step 1: Connect your iPhone 7/7 Plus iOS 10 and Mac to the same Wi-Fi to enable AirPlay on iPhone. - iPhone 7 AirPlay with 5KPlayer instantly replicates the video and audio of iPhone 7 to Windows (Mac). To switch video clips, you can directly start another video on iPhone. To activate iPhone 7/7 Plus AirPlay. - If you need to AirPlay iPhone 7/7 Plus whole screen to Mac (Windows), and record the screen movements, 5KPlayer can also help. Please refer to this screen mirroring iPhone 6s/6s Plus guide which also suits iPhone 7 fine. AirPlay iPhone 7/7 Plus is an exclusive feature to wirelessly stream videos. How to Record iPhone 7 Plus Screen and Save? 5KPlayer features mirroring-based screen recording, making it possible to capture your iPhone 7 (Plus) movements and voices as well, is by far the first free overture provided. Step 1: When mirroing is enabled, click the red icon on Mac/PC to begin screen recording iPhone 7 (Plus). 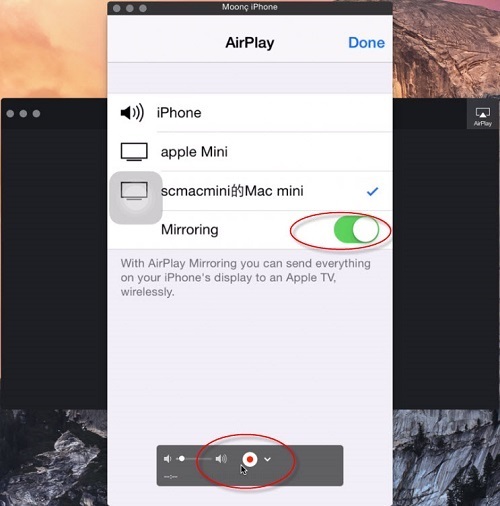 Step 2: The recorded video can be found in the "AirRecord" tab. The above AirPlay iPhone 7 improvements remain to be updated. Currently 5 prototypes of the new iPhone 7/7 Plus are still under test, though attached with a slew of new designs: OLED screen, Li-Fi support, the ditched out headphone jack, and wireless charging, they may not all finally reach the iPhone 7/7 Plus handset. But one thing: If you are considering the iPhone 7/7 Plus level AirPlay, your AirPlay server should be up to 4K streaming. In this regard, the 5KPlayer is worth a try. How to AirPlay HTC to Mac/PC/ TV? Guide on HTC AirPlay streaming to Mac/PC/Apple TV/AirPlay Speaker is here for your preference. Follow this guide designed for iOS 10 iPhone 7 screen mirroring to screen mirror iPhone 7/7 Plus/6S etc to Mac/PC/Apple TV.